When it comes to photography, I have always found turning around to be good advice. It sounds quite trite, but, nonetheless, it is often helpful. When concentrating on trying to photograph one particular scene, we often have blinders on and don't keep our minds open to other possibilities. It can be hard, and perhaps even detrimental, to try and break one's focus in the middle of photographing and, therefore, I do like to finish what I am concentrating on before moving. Once finished, my mind can then be receptive to new possibilities....and so I force myself to turn around and look behind me at what else there is that I might have missed or overlooked. It sounds quite simple, after all, once you are done photographing at a particular site you pack up and can't help but see what's around you before leaving. Sure, but are you receptive to what is around you, or is your mind already in the 'I'm done and leaving' mode? It is one thing to look at what is around you when packing up and another to see what is around you with the idea of making images. It really is amazing to me how often what I find behind me ends up making a more interesting photograph than what I had been concentrating on. This might be because once my attention has been caught by something I am unable to give ample consideration to other possibilities or because some aspect of the scene behind me, such as the lighting, might have changed. Either way, I am often glad that I took the opportunity to turn around while keeping an open mind. 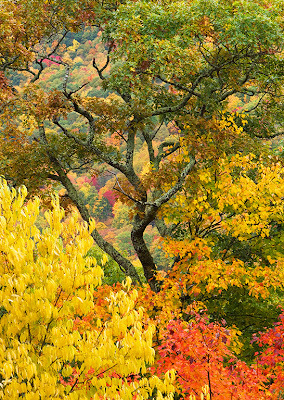 This occurred during the recent workshop I attended in the Smoky Mountains. I had been photographing a field of tall grasses in front of colorful fall foliage, but wasn't really happy with the compositions I was coming up with. 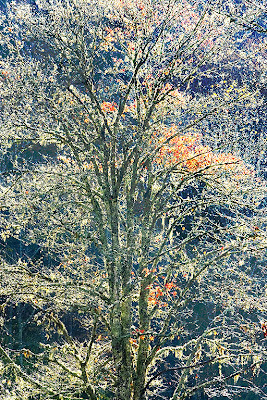 I was planning to move on but 'turned around' before I left and was treated to this magnificent dew covered tree in a bit of fog that looked gem covered, sparkling while it was being backlit by the sun. I underexposed a bit to make the glistening stand out against a darker background. 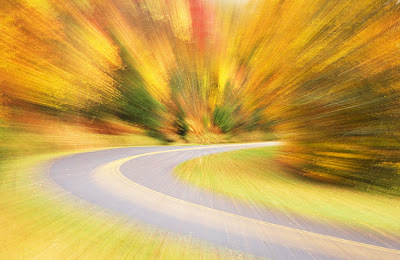 This image was far more satisfying and interesting than anything I had been concentrating on before making the turn! No, the blog is not dead! I haven’t posted in over a week because I have been away and didn’t think it prudent to broadcast that fact over the internet. 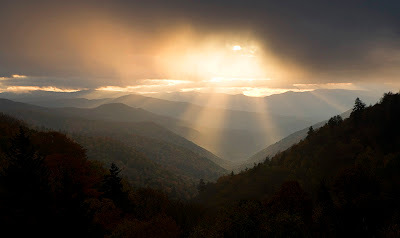 I have been off on a photographic journey to the Smoky Mountains on my second workshop with Nancy Rotenberg. Since my first workshop with her, she has been joined by Don McGowan and Les Saucier to form ‘Photography With Heart’. I could talk on and on trying to describe what a workshop with Nancy, Les, and Don is like, but I am sure that I would not be able do the experience justice. Let’s just say that their workshops embody all the emotional and spiritual journey that photography can and should be. It simply doesn't get any better.